It’s been a long, hot summer and it isn’t over yet, so why not take advantage of this bloomin’ lovely weather and make September the month you start keeping chickens? Collecting fresh eggs every morning is a wonderful job to wake up to, and perfect for a nutritious breakfast to start the day. The kids will love getting back from school to spend time with the hens and you’ll find them hentertaining all year round. Our Eglus are a great choice for first time chicken keepers, but if you prefer to keep things traditional, the Boughton Chicken Coop is a fantastic option. Order your Boughton Chicken Coop in the next seven days and get 10% off! Only £270, usual price £299.99. Win £100 for you and £100 for the Animal Charity of your Choice! This week we were sent this brilliant drawing by one of our younger customers. She loves her Eglu Cube and Cochins so much that she felt inspired to create some artwork, and that inspired us to launch a creative competition…a little something we like to call Peinture Pet! Show us how special your pet is by sending us a portrait, and you could win a £100 Omlet voucher for yourself and a £100 donation to the animal charity of your choice. Not only will you be able to treat yourself and your pet to some wonderful goodies, but you’ll be able to make a difference to the lives of other animals too! Simply draw, paint, collage, stencil, sew, knit or carve a portrait of your pet for your chance to win. You can email a photo of your creation to stephanie@omlet.co.uk, post on our Facebook page, send us a tweet using #peinturepet, or pop it in the post to this address: Peinture Pet, Omlet Ltd, Tuthill Park, Wardington, Banbury, Oxon, OX17 1RR. Please include your name, age, email address and your pet’s name. The closing date is 30th September and postal entries cannot be returned. 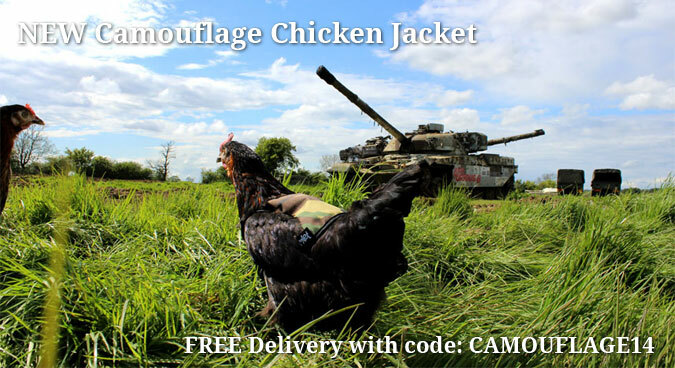 Brand New Camouflage Chicken Jacket Now in Stock! While thousands of hens continue to wear their Hi-Vis Jackets with pride, there’s a new fashion to hit the feathered catwalk. Autumn 2014 – it’s all about the camo, darling! There’s no need to sacrifice style at the end of the summer season. Your chickens might want to wrap up warm but that’s no eggscuse for a hen not to look her best, and luckily, Omlet are all about marrying fashion with function. The brand new Camouflage Chicken Jacket will give your hen that eggstra warmth and protection, while keeping her looking fresh and fly! But this isn’t just for fashion henthusiasts; cool chicks, army birds and rowdy hens go mad for a bit of camo. Whether they’re dolling themselves up for a night out, preparing for battle against an army of henpeckers or forming a disguise to keep badly behaved cockerels at bay, this stylish little number will be a hit. It’s superb for ex-batts and moulting hens too, providing protection during the regrowth of feathers. The Walk in Chicken Run ain’t just for chickens! We hear that a pair of determined ducks recently decided that they wanted in on the luxury of Omlet’s new poultry palace too, quacking at their owners for days until their demand was met. 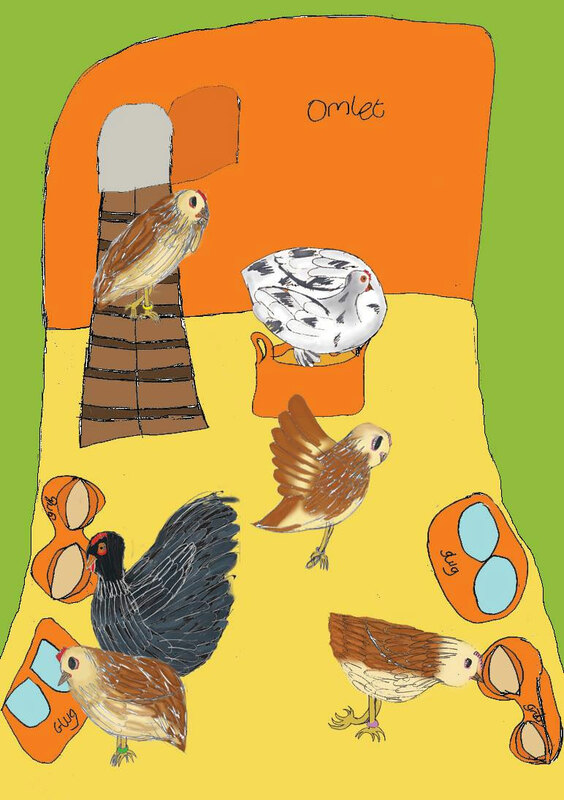 Happy with their new home, but worried that they would be mistaken for hens, the high maintenance birds went on to request a sign that would correct us, and the rest of the world, on their identity. 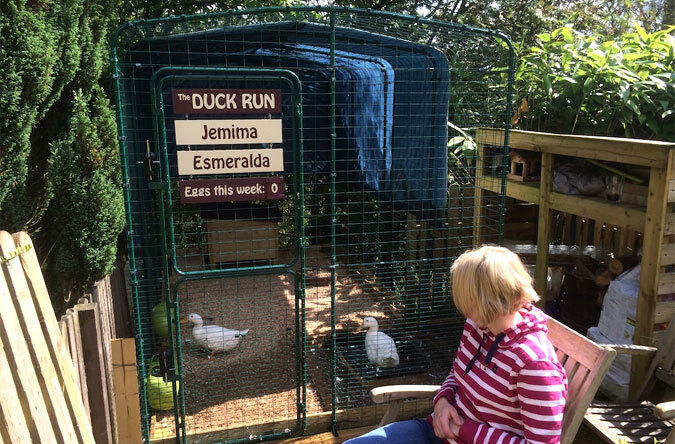 Jemima and Esmeralda are satisfied for now, but we wouldn’t be surprised if they give us a call to demand we sell Camouflage Duck Jackets soon. How Far Does Your Hamster Run Every Night? Fixing a tiny computer with sensors to the top of his Qute and a magnet to the wheel, Matt developed a tracking device to see how many times Biscuit runs around his wheel. As if that wasn’t clever enough, the computer sends a text message to Matt every morning to tell him just how far he’s run. We have a feeling that before long, little Biscuit will be getting his own tv show…and no doubt Matt will too! 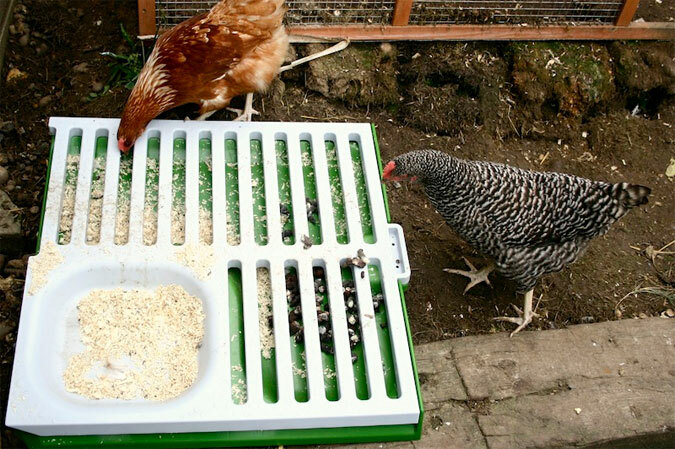 Are you torn between plastic and wooden when it comes to chicken housing? You might want to take a few moments to read this blog. In Fennel and Fern’s latest post, titled Mucking out the Hens, they compare cleaning out the different chicken coops. 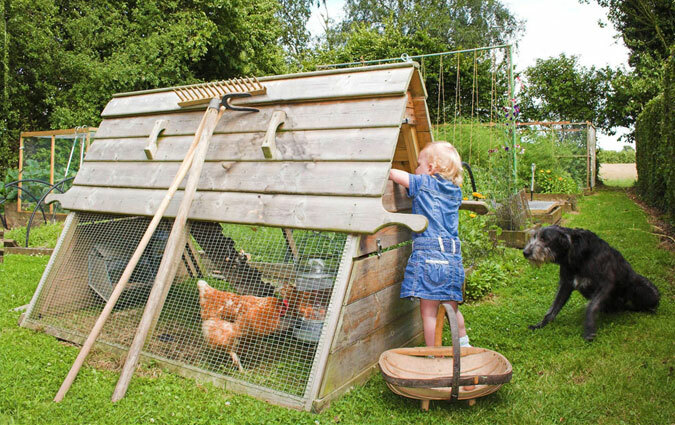 It’s the Eglu Go UP vs. a traditional wooden house in the war of the coop clean and, unsurprisingly to any Eglu owners among you, the Eglu comes out tops. Fennel and Fern discover that a red mite infestation means that the wooden coop is requiring a weekly clean, involving boiling water, washing up liquid and vegetable oil. In their own words: “Cleaning the wooden coop really is a chore.” Meanwhile, the Eglu only needs a wash once a month, requiring very little time, effort or maintenance. Convinced? Take a look at the range of Eglus available to find one to suit you and your hens today! 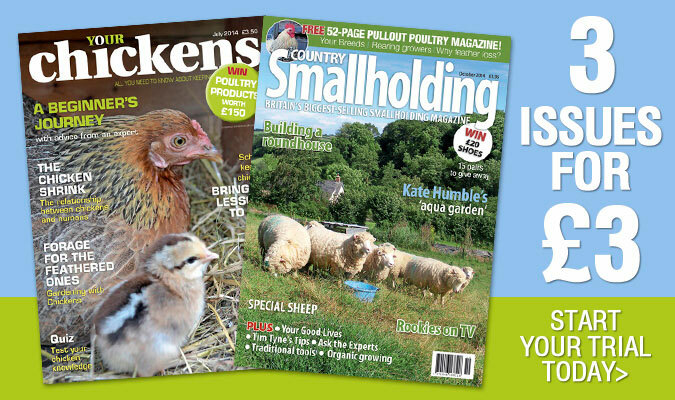 Get 3 issues of either Country Smallholding or Your Chickens magazines for just £3, saving up to 74%. Your Chickens is the essential monthly magazine for the back garden chicken keeper. 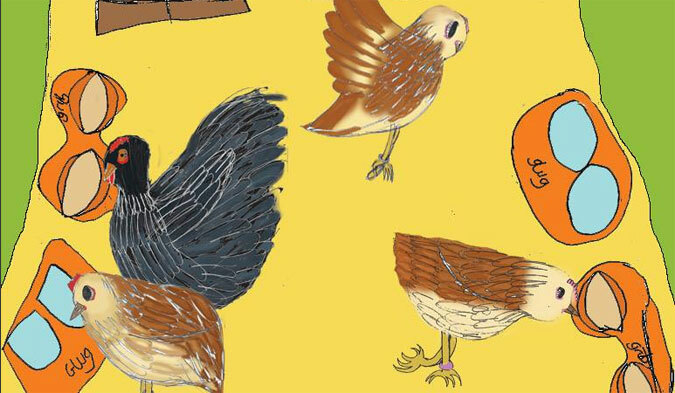 Full of tips, advice and real life stories of people who have joined the chicken keeping boom, celebrating all that is good about chicken keeping! If you’re a smallholder with livestock, growing your own crops, and self-sufficient, or a city dweller dreaming of the ‘Good Life’, or simply interested in everything from home produced food and compost to alternative energy and keeping poultry, Country Smallholding magazine is for you. 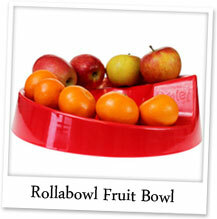 Rollabowl Fruit Bowl – Roll your way to five a day with Rollabowl – the stylish storage solution for fruit. Use the outside ramp for apples and oranges and pop your delicate fruit, like grapes, into the hollow middle section. 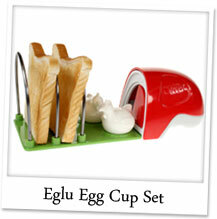 Egg Skelter – Keep your eggs in date order so you always know which one to use first. 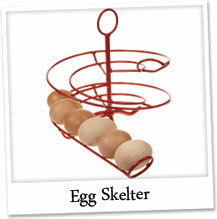 The Egg Skelter holds up to 24 medium eggs and you’ll look super stylish stored in spiral formation. Eglu Egg Cup Breakfast Set – Whether you are lucky enough to have an Eglu or you apsire to be an Eglu owner, this miniature version is a must-have. It’ll hold your boiled egg and two pieces of toast for dipping!